Most of the analysis I do at this site is based on the normal distribution (aka Gaussian aka bell curve). Team records, yards per attempt, sack rate, turnovers, and just about everything else follow a bell curve distribution where most teams or players are bunched around the average and a rapidly diminishing number are found at the extremes. Most of the statistical tools used here such as regression, correlation, or even simple averages are based on the assumption of a normal or quasi-normal distribution. Normal distributions are ubiquitous in sports mainly for two reasons. First, the rules provide level playing fields, fixed boundaries, and predictable cause-effect relationships. Football games always last 60 minutes, the field is always 100 yds long, a touchdown is always 6+ points, and a win is always a win no matter how close the score. Second, there is a significant amount of random luck involved in sports, which by definition is always distributed normally. There are other distributions that often appear in nature and in sports that are completely unlike the bell curve most of us are familiar with. The power law distribution is a prime example. Have you ever noticed how most of the productivity around your office seems to be accomplished by a minority of your co-workers? It’s no different in the NFL, or most anywhere else. The power law is all around us, and is a fundamental property of natural organizations of all types. City sizes, for example, are distributed according to the power law. There are a few extremely large cities, more average sized cities, and very many smaller towns. Earthquake sizes, the structure of the Internet, stock market gains and losses, body mass indexes, gravity, social network connections, wealth distributions, and even Kevin Bacon movies all follow power law distributions. If you've ever heard people refer to the "fat tail" or the "long tail," this is what they're referring to. where x and y are variables and a and b are constants. The constant b is known as the scaling exponent. The problem was that the insurance was priced based on an assumption of bell curve distributions of market risk. A model known as the Correlated Gaussian Copula was developed by a Chinese mathematician named Li, and it was widely used throughout the financial industry for measuring and pricing risk. Unfortunately, financial markets act more like earthquakes than normally distributed phenomena like rainfall or human height. There are lots of minor fluctuations but occasionally the bottom drops out. The power law distribution has a ‘fatter tail’ at the extremes than the normal distribution, meaning extreme outcomes are considerably more likely. One reason we see power law distributions so often is because they are a signature of networks. The picture below could represent a computer network, a social network, highways between cities, or airline routes. But let’s say it represents business connections among individuals. If you’re an entrant into that business market and had the resources to afford to establish a single link, who would you prefer to hitch your wagon to? I’d want to be associated with someone who is already well-connected. I’d want to connect to #4 or #5. Each already has 3 connections and is no more than 2 degrees removed from any other member of the community. I’d avoid #1 and especially #6. They have fewer connections and are further removed from the rest of the group. This process tends to enrich nodes that already have a large number of links. Once the decision is made to link to either #4 or #5, that node would now be even more attractive to subsequent entrants. In organizations like this, the number of links for each node follows the power law distribution. The fundamental feature of power law distributions is ‘scale invariance.’ For example, if you count cities of a certain size, cities half has large might be four times more common, and cities twice as large might be four times less common. If this pattern holds throughout the full range of cities, then you have scale invariance. This relationship means there is no typical city size. There will still be an arithmetic mean, but it won’t actually be the ‘average’ the way we understand it. There really is no average. What does any of this have to do with football? First, compare the NFL with college football. Think of the teams as strongly-linked clusters of individual players and coaches in the network of the overall league. The teams themselves are in turn linked and clustered by division or conference. In college ball, elite players choose their team largely on their own, and it’s no surprise that they select their team based on the team’s current strength and the prominence of the coach. Players who aren’t recruited by the USCs and LSUs of the world will still prefer PAC 10 or SEC teams. And failing that, they’ll prefer any Division IA (or “Bowl Series”) school to the lower divisions and conferences. What does follow a power law distribution in the NFL is Pro Bowl appearances. Just like in your office where a minority of employees can account for most of the productivity, the talent in the NFL is distributed in a similar way. In doing my analysis for drafting defensive backs I noticed just how much Pro Bowl selections were concentrated among the top players. There are plenty of players with no appearances, a smaller group with 1 selection, and then a steadily decreasing number of players with 2, 3, 4, etc. selections. As you can see, the distribution approximates a typical power law distribution. Here is the distribution for QB Pro Bowl selections. It approximates a power law distribution even better. What does this tell us about Pro Bowl selections? Does this mean that being chosen for the Pro Bowl is based on how connected a player is? Partly--because the votes of other players and coaches weigh heavily in the selections, but that’s not what I’m getting at. Besides raw performance, it also depends on how popular the player is, how good the rest of his team is, how often the team plays on national TV, and how good he was in previous years. And all those things are correlated with each other--it's a complex self-organizing system of factors and influences. That’s one reason why we see the power law at work here. Another example of the power law in football is the tenure of coaches. This paper from the UK found that coaching tenure in the Premier League follows a power law very closely. They even looked at NFL coaching tenure and found the same pattern. I’ve done my own analysis and confirmed that coaching tenures in NFL obey the power law distribution. What the researchers conclude is that talent and ability has relatively little to do with how long a coach hangs on to his job. It mostly has to do with being ‘sacked’ or ‘poached,’ and with the random luck of his team. (For instance, Jon Gruden was poached from Oakland and sacked at Tampa Bay). Interestingly, the tenure of leaders of many kinds including Popes, British Prime Ministers, and Roman Emperors follow power law distributions. Power law distributions are noteworthy because they are the signatures of mature self-organizing complex systems. It’s also a feature of ‘rich-get-richer’ systems. So when we see power law distributions, we can make some qualitative inferences about the system we’re observing. 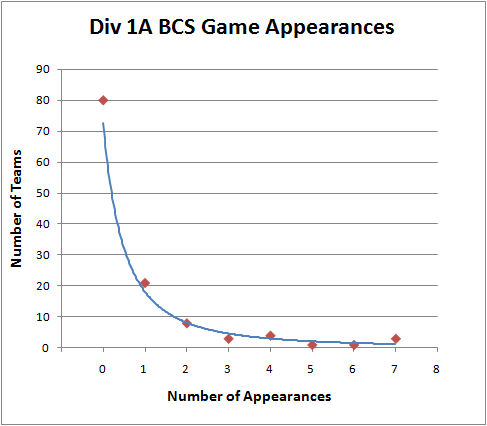 For example, the BCS system is certainly a rich-get-richer organization. We can even quantify just how hierarchical it is and how difficult it is for second-tier teams to break into the elite. The problem with the BCS isn’t just that it’s a rich-get-richer system. That’s just the natural way of the world. Even in supposedly ‘egalitarian’ systems like socialism, the rich still get richer. The difference is that initial outcomes in socialist systems are based primarily on one’s political connections, where in a free market they tend to be based on how productive or innovative one is. The problem is that the elite ‘nodes’ of the BCS have colluded to preserve their status on top, preventing a natural churn in who the elite are. Understanding the implications of power law distributions also helps make more accurate models. For example, there really isn’t an average coaching tenure, and the standard deviation of tenure is not a meaningful statistic. Instead of applying the normal distribution and its associated analytical tools to everything we see, we should be more cautious. If anyone is interested further in network theory and power law distributions, I recommend the book Nexus: Small Worlds and the Groundbreaking Theory of Networks. Regarding the current financial crisis and the misapplication of risk models, I recommend this prophetic 2005 WSJ article.